American business magnate / novelist, Max de Pree, once said: 'We need to give each other the space to grow, to be ourselves, to exercise our diversity. We need to give each other space so that we may both give and receive such beautiful things as ideas, openness, dignity, joy, healing, and inclusion'. And do you know what? 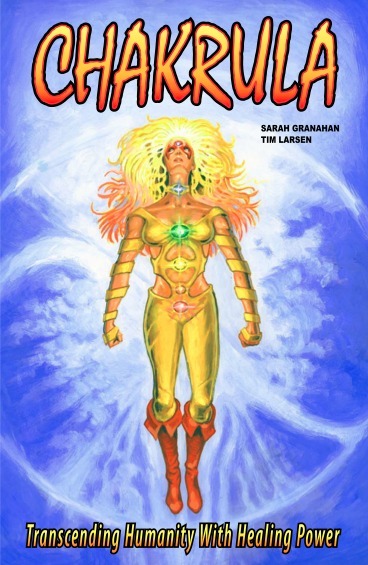 I could not have thought of a better way of introducing to you, my mate, Sarah Granahan, and the conversation we had only the other day, about her smashing spiritual comic books. 1) What are your own origins, Sarah? Plus what path did you take in life to get to where you are today? You know, I ask myself the same question at times when I feel like I don't fit in -- where did you come from? Why are you here? Well, those sorts of questions are the very ones that got me started on my path of creativity and later launching Color My Spirit, LLC, and the Chakrula comic series. But to answer your question more directly, I grew up in the northwest suburbs of Illinois. I am a cultural mutt like many, mixed with a splash of Irish, Native American, German, and Russian heritages. I went to college at the University of Illinois at Chicago (UIC) for Anthropology, where I decided I would one day write my first anthropological novel. While I studied, I felt drawn to learning about the shaman or medicine men in various tribes around the world. And had a few experiences that were difficult to explain. Psychic ones perhaps, but definitely ones that were unique. This got me into studying metaphysical topics even more when not working at my job out of college. I studied healing, the various healers alive today and devoured books about their lives and their techniques. I even attended a psychic development school called InVision in Chicago, IL. I learned a lot, but loved their energy healing courses the most! 2) What inspired you to create ‘Color My Spirit’? Color My Spirit popped into my head back in 2006 or so. I was working for an international humanitarian organization back then, but knew I wanted to have my own company one day. One that would represent healing and touch on topics that involved spiritual and metaphysical matters. I had no idea what it would look like. So I bought the URL and have kept it all these years. I would scribble on a post-it note what I would sell. Back then, it had nothing to do with comics. I had started writing a novel though, so knew that it would fall under the CMS category. And now Koko’s Gift is FINALLY finished -- my first novel. But aside from that, I toyed around with selling rocks and minerals since I love collecting them and possibly making music too. Now I don't know much about that -- but secretly -- I've always wanted to be a lead singer of a band! It’s on the bucket list, you could say. What I'm doing now just fits. Launching the Chakrula series and my novel with CMS. I have a few other products available too, like Chakra Balancing Oils and prints of my artwork. I think in the future I will have a more extensive product line. And who knows…maybe a band too! 3) In your own words how would you describe this story? 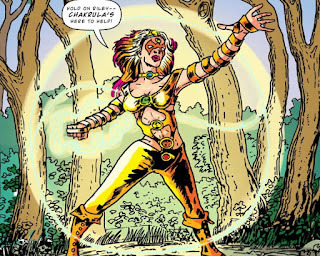 Chakrula is a “super-healer” who can rebalance the major chakras to help people before they harm themselves and others. At the same time, she works with them to realize their immoral actions to affect real change -- and personal growth. Her gifts have been perfected over many lifetimes, which she chooses to use now for the greater good. By day, she is Sierra Rosario, an energy healer and psychic by trade who runs a successful wellness center in the big city. 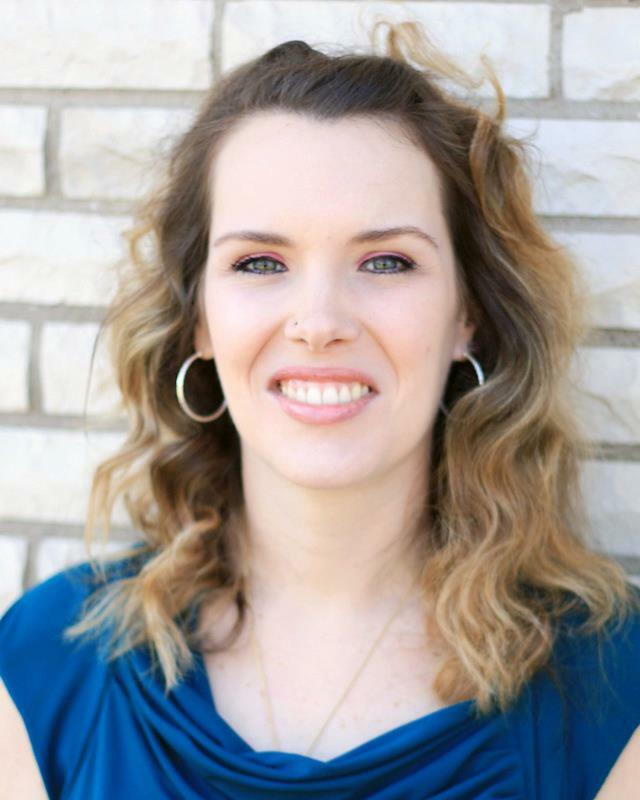 Sierra sees the fear and violence in society, and wants to make a positive contribution. 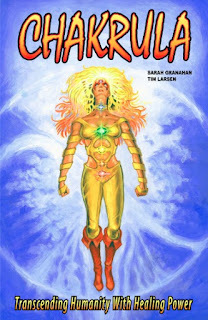 Using her alter-ego, Chakrula, she is able to transcend humanity with healing power. Just good stuff! 4) If ‘CMS’ was a song, what song would it be and why? CMS would be a combination of a few songs, may be mixed together real well by some brilliant DJ. The songs I would include would be, “La Femme D’argent,” “Kelly Watch the Stars,” and the haunting but melodic sounds from “Remember”, by the band Air. Sometimes as majestic as “Paradise” by Coldplay, or as righteous as “Bodysnatchers” by Radiohead. With a splash of Lady Gaga and some classic notes from “When the Levee Breaks” by Led Zeppelin. Does that make sense? 5) If you could get a celebrity – either living or dead – to promote your comic, what person would you get, and why would you want to choose this particular person? Oh wow! Let’s see! I'd have to say my all-time favorite - Angelina Jolie. I love the power she portrays, and all the humanitarian endeavors she has been involved in over the years. Plus she’s a mom like me. And I think she'd make a wonderful Chakrula, when the series makes it to the big screen! Either her, or for some reason, Kim Kardashian. Because I could see Kim as a great Chakrula too; and know she comes along with a fabulous marketing package. I don't think Kayne would mind…the suit is pretty hot. 6) What have you learnt about yourself through this endeavor? And were their any unforeseen obstacles you had to contend with? I have learned so much breathing life into my writing projects. The novel may have taken me 6 years to finish, but the comic series took me a couple of months to write. In that time I launched 'Color My Spirit', 'LLC', and revised the comic series and novel a few different times. And I have to say, with little time to work on my creative endeavors now that I am a mother with another child on the way, I have made great strides! When I worked on the novel, I was single with a full time job. But for the most part, weekends and evenings free. Now my full time job is taking care of my daughter and helping out at home along with balancing other needs. So one could say I work best under pressure, perhaps? I am impressed with the premise I have created and the stories developed. And seeing them all come to life in a year’s time is fabulous! I can't wait to see what else life has in store for me! As for obstacles, sure, I had a bunch. There was a lot of unchartered territory I took on. But after the initial frustrations cleared, I saw them as what they were -- learning curves. Next time around I will be more prepared (wink, wink). 7) Tim Larsen style of art is just great. It appears very clean looking and seventies inspired. Now is this what you initially envisioned for your book? Plus what’s the biggest difference between what your first had in mind, and how it has turned out? Thank you. I agree. Tim Larsen’s artwork is fabulous, and was the main reason why I decided to work with him. I also saw in his portfolio, that he had been able to display spiritual matters and sequences, which I knew would be key for the artist working on this project. I've never thought of it as seventies inspired, but you know, I am one for a good pair of bell-bottom cords and some Led Zeppelin tunes. So I guess that sort of style just fits. When I wrote the Chakrula series, there were certain aspects that I had in mind, like how Chakrula’s suit would look, and what Sierra Rosario, the main character, would look like as well. I definitely provided my notes to Tim. But he has always had the free will to make other suggestions using his own creative gifts. What impressed me the most when we began working together, is that the imagery he created just fit -- it worked. He was able to capture the energy fields I envisioned. It’s been a fun trip, for sure. 8) During your time in this field, what is the one thing that has kept you in good stead? I'd have to say just the thought of Chakrula being shared with other people. That’s what kept me going. Kept me inspired. And knowing there are other stories still to be drawn and shared -- it’s amazing. 9) If your comic had a motto, what would it be? 'Transcending Humanity With Healing Power'. Wow! Beautiful words, Sarah. Just beautiful. Don't you agree, dear readers? So when you have the time, please check out Ms Granahan's website, Color My Spirit, and of course, follow her on facebook too. Click-Click. View-View. Then relax. Uhmmmmm.